Your hard drive is quite likely to be one of the slowest components of you computer. Compared to how fast data is transferred between other components of your computer, the hard drive moves at a crawling pace. Often this does not cut it when you have to do hard-drive intensive operations. Your RAM is literally thousands of times faster than your hard drive. So unless you need tons of storage space, you can gain huge boosts in speed simply by using your RAM instead of your hard disk. Of course there is often no option to use the RAM in lieu of your hard drive. This is where RAMDisk comes in. It is a small application that provides you a virtual disk drive, which instead of storing data to the hard drive stores that data to the RAM. This drive will then show up as a normal partition on your system that you can copy files to and from, and pretty much use as a normal drive. Except that you will get speeds in the GBps range in this drive. Not only can this drive be accessed like any other, you can perform common operations such as format it in NTFS, resize the drive, create additional partitions etc. You can create a drive of minimum 5MB all the way up to 64GB, although the free, unlicensed version only allows for drives up to 4GB. Considering that you need to have that much RAM free in order to create a RAM drive, this seems pretty reasonable, and unless you have oodles of RAM (16 / 32 GB or more) it aught to be enough. RAMDisk also ensures that you have 512MB RAM free after creating the RAM drive, so consider that the maximum for your system in any case. In 32-bit versions of Windows, the amount of RAM that the system can use can be limited to 4GB. If you have more than this amount of RAM installed, RAMDisk can utilize this as a RAM drive so it doesn’t go waste. A very important thing to know about RAM drives is that they are volatile. If you reboot your system, the contents of your RAM are lost, and so are the contents of your RAM Drive. This can obviously be of some concern. For this RAMDisk has a simple solution. It can periodically save the contents of your RAM drive to a file of your choice; it can also save the contents to disk when you shut down the application. This file can also be loaded automatically when RAMDisk starts up so you have your data ready. 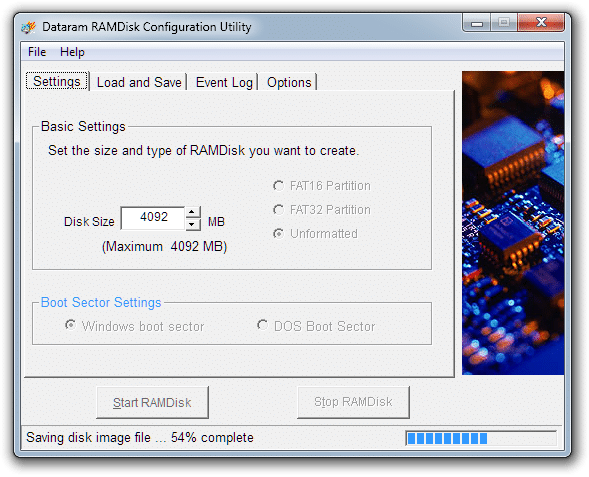 Another easy option RAMDisk includes is to set it as the temporary directory. This can greatly increase the performance of some of your applications; software setups for example, will work much faster as they will be extracting data to the RAM rather than the disk. It is important to know that not every application will register an increase in performance if you use this software. Some applications are already optimized to make best use of the RAM in combination with the hard disk, and by using this software you actually rob them of the free RAM they would have otherwise better used.